People who like reading eBooks will choose the Kindle eReader, for its eye-friendly screen, and the gigantic Amazon eBookStore. As the magnate in eBooks area, Kindle insist his AZW format, ignoring the popular ePub format. Kindle can’t read Barnes Noble directly, even if there is no DRM, the B&N in ePub format, you still cannot read them on Kindle. Don’t worry, just 3 steps, you can read Barnes Noble ebook on Kindle. NOOK for PC is tools to read B&N ebook in PC, download NOOK for pc and install it, login your BN account and download ebook title in NOOK for pc. ePub Converter is to remove BN ebook drm and convert to Kindle format with 1-click, download and install ePub Converter. 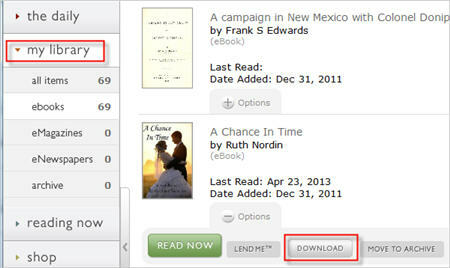 Run ePub Converter, click NOOK button to import BN ebook file into converter. Select output format is Kindle .mobi format. Click Convert button to convert to Kindle format. connect Kindle reader to computer by USB cable, there will be a Removable Disc in My Computer, copy .mobi file into “document” folder, disconnect kindle then you can read it in Kindle reader. Eye-friendly screen of Kindle. If we read on computer, we easily get eye-tired, but for Kindle, this will not happen unless we read unless 3-4 hours. Battery life. You are on a train-trip, for Kindle, its battery can be at least last for a week without any charging. Weight. Twhile Kindle 3 is 240g and Kindle 4 is 170g. When we read eBooks, we often hold the eReader in our hands.